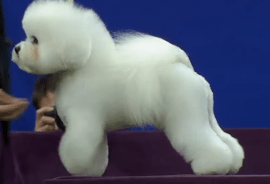 Every year, the most beautiful dogs in the world prance around on stage at the Westminster Dog Show and everyone marvels at their beautiful coats. What are these dogs eating that gives them these beautiful coats that make them “world class” champions? As any pet lover may expect, most of these animals have custom diets that are not anywhere near what the average pet owner feeds his or her dog. While most “experts” will tell you to stick to feeding your pet actual pet food, the diets of these canine champions may suggest something a bit different. An English toy Spaniel known as Benjamin is as finicky as a feline. According to the owner, give him any meal more than a couple of times and he turns his nose up at it, except for one thing… Sauerkraut. While Benjamin’s treat is a bit out of the norm, many of the other dogs like things many of us have every day, such as ice cubes, ribeye steak, green beans, fruit, eggs, and yes, honey. One Pennsylvania couple, Timothy and Dawn Eilber, spend roughly $1,000 every month putting together the monthly meals for their four dogs. You read that right… $1,000! The daily bounty for the canines includes bone and organ meat, coconut oil, apple cider vinegar, turmeric paste, and raw honey. “We think we’re crazy sometimes, but this makes us happy,” Eilber stated. I bet it makes the dogs happy too, or at least it better! Unlike cats, at least according to the American Kennel Club, honey in small doses is okay for dogs. They, just like humans, can benefit from the many healthy properties of raw honey. However, the organization does recommend some precautions when feeding honey to your dog. Because the sweetness of the honey can cause it to linger on the teeth of the canine, the AKC recommends brushing your dogs teeth after you give him or her the tasty little treat. In addition, the sugar is not something dogs usually consume, so make sure the dog is getting some exercise on a regular basis to make up for the added calories to the diet. The AKC also warns honey should not be fed to dogs with compromised immune systems or puppies. Nor should it be given to obese dogs or diabetic dogs. We would take that a step further and tell you to run any changes to your pet’s diet by your vet just to make sure you have all your bases covered. Interested in trying some raw honey? If you want to get your order started with us, just click here.